Court to ask Interpol to issue arrest warrants for several top-ranking IDF officials. The crime? Defending Israel. Turkish court on Monday ordered the arrest of four former Israeli military chiefs over the 2010 Mavi Marmara incident, AFP reports Monday, that plunged relations between the former allies into crisis. The court will ask Interpol to issue international arrest warrants for the four men, lawyer Cihat Gokdemir told AFP. The arrest warrants have been issued for former IDF Chief of Staff Gabi Ashkenazi, military intelligence chief Amos Yadlin, IAF intelligence chief Avishai Levi and naval forces commander Eliezer Marom. 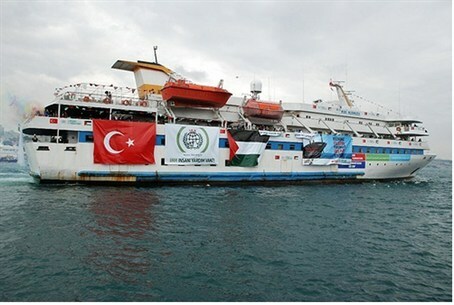 The Mavi Marmara, which claimed to international media to be providing "humanitarian aid for the people of Gaza," was the largest ship in the flotilla aimed at breaking Israel's Gaza blockade on May 31, 2010. The ship defied orders to turn around and dock at the Ashdod port. After it ignored repeated warnings to change course, the IDF boarded the vessel - only to be attacked by Islamist extremists on board. The soldiers had no choice but to open fire, resulting in the deaths of nine activists on board; a tenth activist died from clash-related injuries earlier this month. After an investigation, Israeli authorities discovered the vessel to be carrying no humanitarian aid - in fact, no aid supplies at all - whatsoever. The incident caused a strain in the relations between Turkey and Israel, as Turkey demanded that Israel apologize for the raid and pay compensation to the families of those killed. Israel refused, and Turkey responded by withdrawing its ambassador from Israel and expelling the Israeli ambassador in Ankara. It was under pressure from U.S. President Barack Obama that Prime Minister Binyamin Netanyahu apologized last March to Erdogan for the deaths of the activists on the Marmara and talks began on the compensation agreement. Controversy around the exact events of the IDF's detainment of the flotilla, who was present, and demands for restitution have been endless, despite over three years passing in the interim. Earlier this year, an "activist" allegedly aboard the Marmara made a number of public accusations against the IDF's role, claiming that a helicopter had been shooting at the passengers while the IDF towed the ship to port. Will the arrest orders hold? Turkish media have said any agreement would have the status of an international agreement and would give the Israeli military immunity from any liability over the incident. It was not immediately clear what political repercussions the court's verdict would have on the negotiations. "We don't know yet how an agreement will address the issue of criminal charges against the former Israeli commanders," said Ozdem Sanberk, a retired ambassador who represented Turkey on a United Nations panel investigating the Mavi Marmara raid. "In principle, the judiciary is independent and we must say that the judicial process is independent from the diplomatic track," he told AFP. An Israeli official, speaking on condition of anonymity, described the court's decision on Monday as a "ridiculous provocation". "If this is the message that the Turks want to send to Israel, it was perfectly well understood," the official told AFP Monday, declining to elaborate further on what this meant for the reconciliation process.